A cinematic orbiting aerial establishing shot of the small rust belt town of Rochester, Pennsylvania, about 25 miles north of Pittsburgh. Bridges over the Ohio River in the distance. 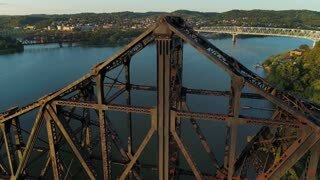 A high angle lowering aerial establishing shot of the various bridges spanning the Ohio River in Western Pennsylvania. The towns of Monaca and Rochester, PA in the distance. A slow forward winter aerial establishing shot of snow covered roads and homes in a rust belt residential neighborhood. Rochester and Ohio River in the distance. Pittsburgh suburbs. A slow forward winter aerial establishing shot of snow covered roads and houses in a rust belt residential neighborhood. Rochester and Ohio River in the distance. Pittsburgh suburbs. A slow reverse winter aerial establishing shot of snow covered roads and homes in a rust belt residential neighborhood. Rochester and Ohio River in the distance. Pittsburgh suburbs. A slow rising forward winter aerial establishing shot of snow covered roads and houses in a rust belt residential neighborhood. Rochester and Ohio River in the distance. Pittsburgh suburbs. A slow forward aerial view of the Pennsylvania countryside. Towns of Rochester and Beaver on the Ohio River in the distance. Pittsburgh suburbs. A slow forward aerial wide view of the Pennsylvania countryside. Towns of Rochester and Monaca on the Ohio River in the distance. Pittsburgh suburbs. A slow forward aerial view of the Pennsylvania countryside. Towns of Rochester and Monaca on the Ohio River in the distance. Pittsburgh suburbs. A high angle reverse rising orbiting aerial establishing shot of the business district of a small Pennsylvania town on a late summer day. Bridges over the Ohio River in the distance. Pittsburgh suburbs. A slow orbiting aerial view of an American Flag in the business district of a small western Pennsylvania town. Bridges over the Ohio River in the distance. Pittsburgh suburbs. A high angle orbiting aerial establishing shot of the business district of a small Pennsylvania town on a late summer day. Bridges over the Ohio River in the distance. Pittsburgh suburbs.